The villages of Ortisei, S. Cristina and Selva, (all within a total distance of 8 kilometers) offer outstanding natural beauty as well as a broad choice of activities centered on sport, tradition, art and culture. Val Gardena is a world-renowned skiing and hiking area and the resort of choice for trend-conscious, active vacationers and sport lovers. Ladin culture is firmly rooted in this region, through the spoken language, the art of wood carving and a wealth of traditions and local customs. 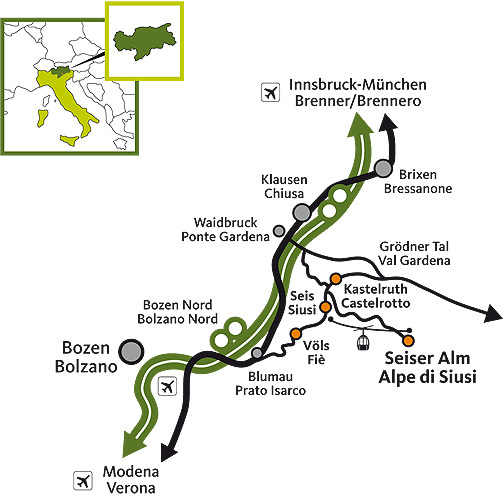 Hospitality and gastronomy have a long tradition in Val Gardena, it’s worth to check it out! Surrounded by the impressive scenery of the Dolomites, the area of the “pale mountains” is one of the most favourites by the bikers, too. The many varied biking routes with their steep ups and downs rimmed by fantastic mountain scenery are uniqueness in its kind. 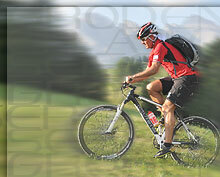 The Val Gardena offers diverse mountain bike routes to meet every demand. Epicures and active sportsmen as well as conquerors will reach their goals. The Dolomites’ passes are the biggest challenge for every biker since all times. Glory in the fantastic nature the holyday region Alpe di Siusi in the Dolomites (World Natural Heritage) and all its fascinating many-sided splendours while on an excursion, a hike, a mountain climb or a mountain-bike tour or maybe even trying a hang-glider experience, while riding, playing golf or swimming or even just sunbathing, while strolling about visiting some charming picturesque village or simply enjoying being lazy. In summer the Alpe di Siusi and its neighbouring villages of Castelrotto, Siusi, Fiè and Tires al Catinaccio offer countless possibilities of trying local specialities and enjoying festivals and traditions. The local inhabitants of this region are unique, and proud of the diversity of their homeland, where time-honored traditions are still a part of daily life. The hospitality which you will enjoy here comes from the heart, and is part of the natural charm of this region and its people.